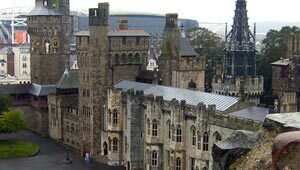 Cardiff Castle has around 2000 years of history. The oldest part of the castle is the old keep in the centre and this is surrounded by the more modern extensions that made it a family home for the Bute family. On your guided tour, you’ll get to see some of the lavishness of the insides of the castle although we did find the guide a little tedious. The building though is marvellous, so don’t let that put you off. The guided tour begins on the ramparts of the castle and continues into the corner tower. From there you see the rooms that were used by the Bute family as their home some of which have more history than others. The library and the great hall are very impressive. Although we enjoyed our trip to the castle, as with many historic buildings we’ve visited, we felt there were quite a few parts of it we didn’t see. Before or after the guided tour of the inside of the castle, you can wander around the rest of the site at your own pace. The peacocks are usually wandering around the great lawn and keeping the photographers entertained. The big highlight though is to explore the old keep. To do this, you’ll need to climb up the stone stairs and there’s not much inside when you do, but this is the part of the castle that feels most like a ancient fortress rather than a stately house. You get a nice view of Cardiff from the top too. You can also use this time to visit the shop and cafe on the lower floor of the main castle building. Cardiff Castle is next to ButePark in the city centre, near to the Millennium Stadium and is one of the stops on the Cardiff Hop-on Hop-off Bus Tour.